Where in the World is Mrs. Fucoloro? : Hear Ye, Hear Ye! 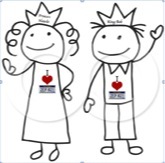 Welcome King Bob and Princess Natalie, aka Team Cange, the newly crowned winners of License Plate Game 2011. The torch has been passed to the West Coast for the first time since the inception of The License Plate Game, in record time, no less! The winners found the winning license plate on June 11, 2011. That is a record that will be difficult to beat! Congratulation to the King and Princess and keep your chins up to the rest of the competitors. Remember, the game lasts until Labor Day Weekend! No 'Blue Hawaii' This Year!